Learn more about the process of applying to PAFA, important application deadlines, and access our online application and portfolio submission portals. 30% of PAFA's student body is comprised of transfer students. Read about the requirements needed to transfer to PAFA, and explore our transfer agreements. PAFA welcomes applications students from all around the world: Read about the requirements needed for your application, including test scores, visas, and more. Information about creating and submitting portfolios for PAFA applications, as well as the different ways you can meet with PAFA Admissions. At work in the group Sculpture studios. A student works in the metal studio. Maya Wilson, YSA II. A student works on their painting in their private studio space. Justine Ditto, The Body Achieves (The Spirit Rules Secretly Alone), installation view. Diego Rodriguez Carrion, Dream of Jacob. Students at work in the printmaking classroom. Nicole Parker (BFA '17) in the studio. 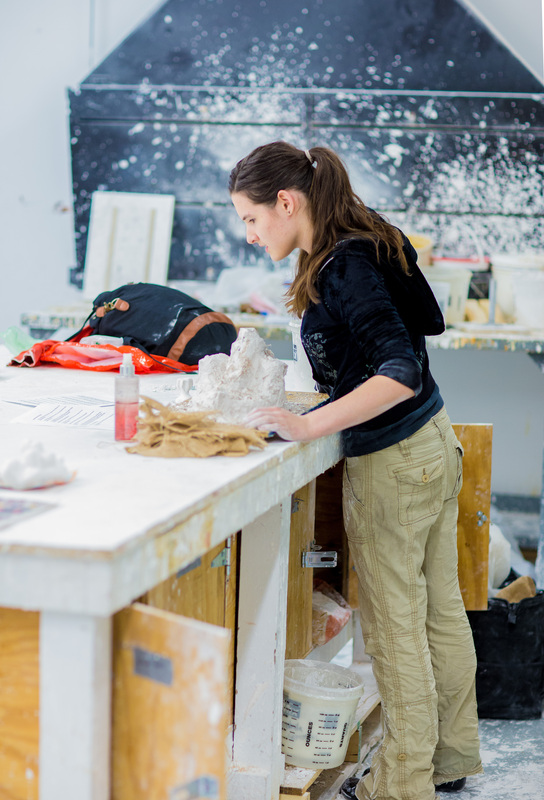 The Bachelor of Fine Arts (BFA) is a four-year program that pairs a creatively focused liberal arts education with demanding studio art training in one of our five majors. Studio arts training in Drawing, Illustration, Painting, Printmaking, and Sculpture provides the foundational skills, intellectual context, discipline and creativity needed for a lifelong pursuit of making art. Support and guidance from our nationally-acclaimed faculty give our students the technical artistic skills and 21st-century skills to prepare them for their future careers. This program starts with a rigorous first-year foundation experience spent studying both traditional and contemporary forms of art-making, along with the introduction to a thorough conceptual liberal arts base focusing on art history and English composition. The Foundation Year program is crucial to gain technical skills and provides students the opportunity to take beginner level courses in all of our five majors. Second- and third-year students in this program are spent with a mix of focused liberal arts and studio classes. During this time students can rent shared space in a group studio, which functions as a community space where they work collaboratively and support with other students as they head into the final year. Fourth-year students are given a personal studio, where they learn what it means to be a practicing studio artist. The student is given 24-hour access to this creative space to create. Students sign up to have faculty critics and artists from the Visiting Artists Program visit their studio throughout the course of the semester to give direction and feedback as they prepare for the Annual Student Exhibition, a yearly exhibition that gives students the opportunity to curate, install, and sell their work in our renowned museum galleries. Since 1929, PAFA and the University of Pennsylvania have offered a unique Bachelor of Fine Arts program which combines PAFA’s rigorous fine arts training and a final year of liberal arts through Penn, culminating with earning a BFA degree from the University of Pennsylvania. Marked by flexible and personalized course options, the PAFA/Penn BFA is ideal for self-motivated and committed students seeking to pursue their artistic passions as well as their intellectual interests. This program can be completed in a time frame that matches an individual student’s needs. In addition to PAFA's student-faculty ratio, students in the PAFA/Penn BFA program are exposed to a wide variety of faculty, educational environments, and course sizes at Penn. Students in this program also experience all that the Penn community has to offer, including the Fischer Fine Arts Library, Van Pelt Library, and the ability to attend talks, lectures, exhibits, and performances on Penn’s campus. 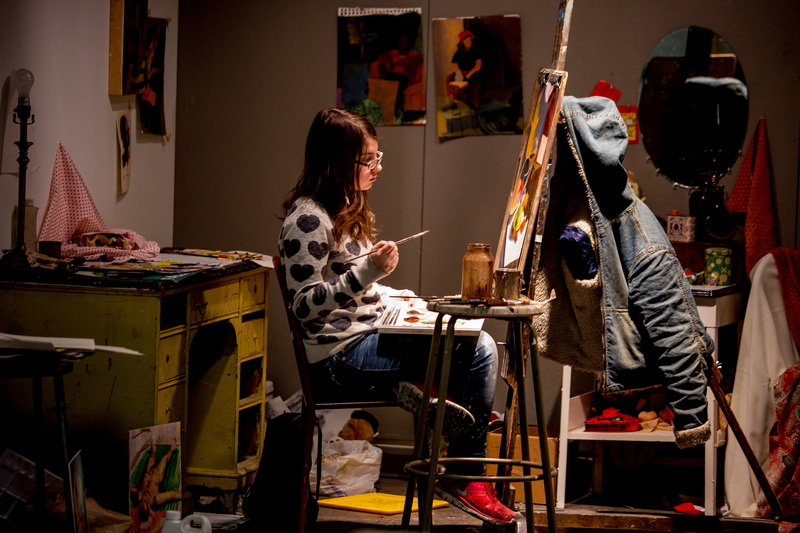 All studio courses are taken at PAFA, culminating in 90 credits in a combination of our five majors. At Penn, students have access to numerous courses and disciplines taught through the Penn's College of Liberal and Professional Studies . Students must complete 16 courses at Penn: 4 in Art History and 12 in any combination of liberal arts electives to deepen and broaden their engagement with the ideas and practices that are most meaningful to them. The program begins with a rigorous Foundation year at PAFA, much like our traditional BFA program. Once this year is successfully completed, students have the option to start taking their courses at Penn. The second year in this program is spent focusing on studio classes; in the third year, students gain access to their own private studio space. Most students use their fourth and final year to enroll full-time at Penn to finish required courses to earn their degree. The flexibility of PAFA's undergraduate programs allow our students to choose their own path—explore their stories. Want more information about PAFA's degree programs? You will receive a copy of our viewbook, as well as information on events and occasional emails from our Admissions staff. Please disable pop-up blocking on your web browser.